We recommend having your diamond ring cleaned and inspected every year or if it undergoes any potential trauma. Inspections may help prevent the loss of a stone and extend the life of your jewellery. 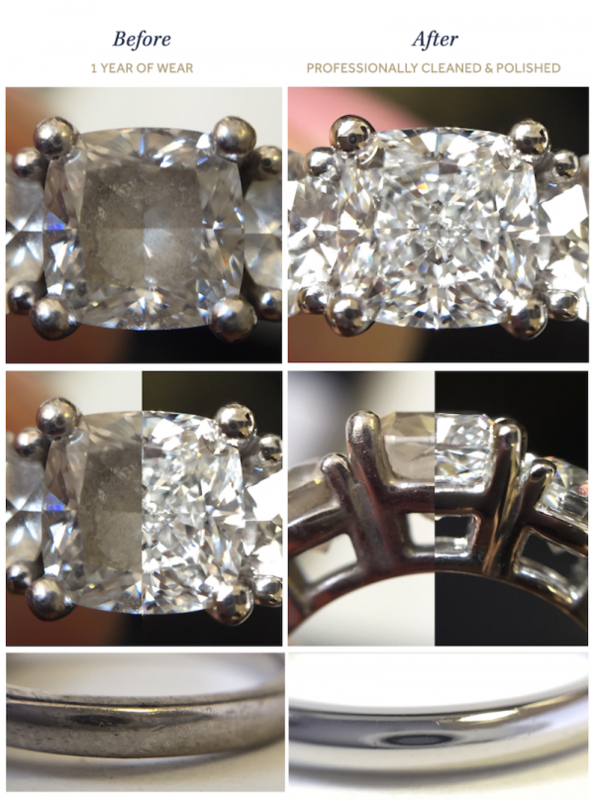 This ring cleaning and inspection service is free of charge to our UK customers. We kindly ask that you cover the cost of shipping back to us, and we’ll pay for return shipping. Repairs to your ring mounting can also be done at this time. Over time your ring may lose its high polished finish so we are happy for you to drop or post your ring into us once a year, for a complimentary clean and polish. Whilst your ring is back in our care, we will conduct an inspection service free of charge to make sure your ring is in excellent condition. Jewellery is susceptible to general wear, activities or accidental damage. This is particularly true for engagement and wedding rings which are worn everyday, so we are happy to assist in restoring your ring back to its original condition. We do not provide warranties for damage due to negligence, product loss, loss of stones or theft. Damage or loss that results from failure to obtain repairs necessary to maintain the integrity of the product are also not covered. Removing scratches or small dents. Replacing small diamonds or gemstones from pavé or halo settings (so long as the ring has no evidence of mistreatment). Tightening and securing center gemstone(s). Mistreatment by exposing your ring to harmful materials or putting unnecessary pressure on your ring. Bent, caught or worn out claw(s) allowing a stone to fall out or be lost due to normal wear or other damage. Lost stone or a stone has fallen out due to chipping or breaking caused by reckless wear or other damage. For all of the above services, we kindly ask that you cover the cost of shipping and insurance back to us. We will cover the cost of the return to you. For full terms and conditions, visit our Lifetime Manufacturer Warranty.